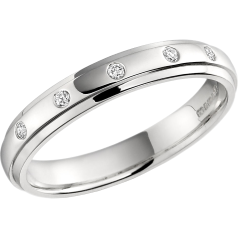 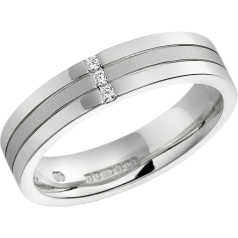 If you prefer to wear fewer rings, ladies’ diamond set wedding rings can also function as a plain band and diamond eternity ring in one. 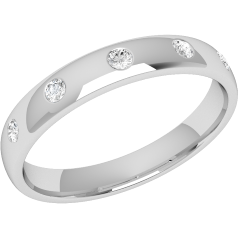 This way besides the comfort of wearing one ring instead of two, you can also lower your costs. Our ladies’ diamond set rings are available in white gold, yellow gold, yellow & white gold, platinum palladium. We offer ladies’ diamond set rings with larger or smaller diamonds, placed all along the shank or only as accent diamonds, with the hope that everybody finds a ring to match their taste. Although the wedding lasts for only one day, the wedding ring is worn for the rest of your life, so it is important to select a ladies’ diamond set ring that makes you feel good every time you look at it. Round Brilliant cut, Baguette, Princess Cut, Round & Baguette, Princess & Baguette – this is the selection of stone shapes that can be set into our ladies’ diamond set wedding rings.